and next door to Vermont Sun Fitness Center. This entry was posted in Midd Blogosphere and tagged For Faculty, For Staff on November 24, 2014 by Margaret Paine. This is the fifth in a series of postings from Asia, as I and my colleagues visit alumni, parents, and friends in the region. This posting is by Mike Schoenfeld ’73. The final stop of our week-long Asia trip is in Singapore, and we are greeted by the city’s tropical heat and humidity. Just one degree north of the equator, the tidy city is lush with vegetation overhanging the immaculately maintained streets. Knowing we are headed back the next day to the late fall weather in Vermont, we enjoy the warm welcome. Middlebury’s presence in Singapore is less developed than in China and Japan. Often a short-term destination for business transactions, it is only recently that Singapore has become home to a growing number of alumni. Regular visits to the strong local schools by our admissions office have yielded an interesting mix of Singaporeans, ex-pats from many countries, and United World College students coming to Middlebury. Now some have returned. We take the time to visit the UWC and make a presentation to an auditorium full of prospective students. With 10 students from this school at Middlebury already, the interest level is high. 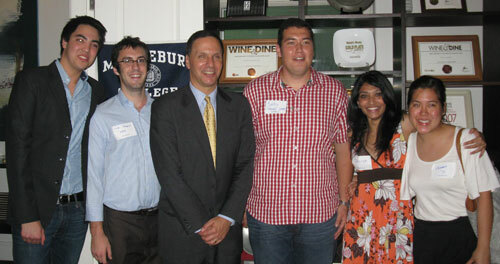 Young alumni in Singapore turned out in force for a Middlebury reception with President Liebowitz at Flutes at the Fort restaurant. Pictured left to right are Kyle Smith ’13, Luke Douglas ’09, President Liebowitz, Bobby Gosney ’09, Divvya Dasan ’09, and Chalene Pek ’10. Our reception later in the evening shows that our trip here is well worth the effort. As was the case for our gatherings in Tokyo, Beijing, and Hong Kong, we meet a record number of parents and alumni who are delighted to see us. Fred Myers ’67 cashed in some frequent flyer miles and flew up from his farm in Western Australia just to be here. Edi Sentosa, MIPM ’93, made the trip from Indonesia. Young alums, many of whom had not met each other before, worked their iPhones to exchange contact information. The Middlebury network expands. Our work nearly done, we reflect back on the trip with Rick Scanlon ’93 later that evening over Thai food. Rick’s story is becoming familiar—a Midd undergrad and Language School alum who finds extraordinary business opportunities in Asia and makes a life for his family here. Now he wants to stay connected to his college and is offering his help. All the ingredients for Middlebury’s global future in Asia are here—promising students, extraordinary educational opportunities, language-adept and culturally proficient graduates, parents and alums who want to give back. All we have to do is keep connecting the dots. This entry was posted in Midd Blogosphere and tagged Uncategorized on November 13, 2011 by Margaret Paine. This is the fourth in a series of postings from Asia, as I and my colleagues visit alumni, parents, and friends in the region. This posting is by Mike Schoenfeld ’73. The ride from the airport to the island city is dramatic, with the rugged forested mountains framing crowded skyscrapers of every conceivable shape and size. There is movement and activity everywhere, from the bustling harbor to the lively canyon-like streets. The tidiness of Tokyo and constraints of Beijing give way to the openness and energy of Hong Kong. Our relationship with Hong Kong is deep and strong—stronger in many ways than our relationship any other city outside the United States with the exception of London. Most Middlebury presidents visit here at least once in their tenure, going back as early as President Sam Stratton in 1959. It was at a dinner for Stratton hosted by C. V. Starr that Tom Kan ’64 first learned about Middlebury. Fifty-two years later, Tom proudly introduced Ron at a small dinner that included the Hong Kong parents who hosted a reception for John McCardell in 1997, Kenneth and Nancy Ting P’96. The difference on this presidential visit is the level of Middlebury’s involvement in the region. Fifteen years of international recruiting in admissions, coupled with the opening of the schools abroad in China and Japan, has dramatically increased the number of students who want to work and study in Asia. They join the early pioneers who picked up their language skills in the Language Schools and the undergraduate program beginning in the late ’60s and accelerating into the ’90s. The opportunities of the global economy bring plenty of jobs, and Middlebury alums have just the right skills to take advantage to that. When you add Monterey alumni to the mix, you have more than a critical mass to form a significant Middlebury network. No place is this network stronger than in Hong Kong. The alumni and parent reception at the China Club is packed as Ian Malin ’99, the newly elected president, introduces Ron. Even the core group of volunteer leaders is surprised at the strong turnout. We all feel that this is just the beginning of a whole new chapter in Middlebury’s presence in Asia. This entry was posted in Midd Blogosphere and tagged Uncategorized on November 12, 2011 by Margaret Paine. This is the third in a series of postings from Asia, as I and my colleagues visit alumni, parents, and friends in the region. This posting is by Mike Schoenfeld ’73. The traffic on Jinbao Street was heavy on a relatively pollution free day on our way to Tiananmen Square. The vast number of bicycles I remembered from my visit 15 years ago has been mostly replaced by new model taxis, buses and cars. Shoppers in fashionable western clothes walked by the luxury stores, peering into store front windows at Gucci hand bags and the Cartier jewelry. We made our way with thousands of others to watch the ceremonial lowering of the Chinese flag strategically placed at the head of the Square. As we waited for dusk to arrive, we were dazzled by images of stunning landscapes, cultural treasures, and modern architectural wonders on two gigantic video screens that framed the view to Mao’s mausoleum. All attention focused as the flag slowly dropped, with the daily ritual captured by hundreds of cell phone cameras. 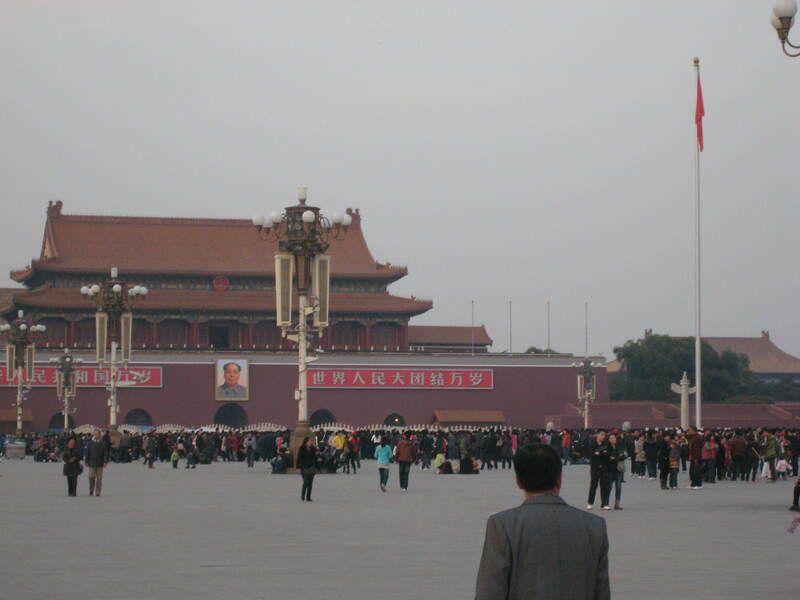 Soldiers crisply gathered the flag for the march across the street and under the large portrait of Mao guarding the entrance to the Forbidden City. The large crowd orderly dispersed under Chairman Mao’s watchful eyes. Our brief time as tourists provided us with a small glimpse of the confluence of history and opportunity that defines the new Beijing. As our meetings with alumni and parents progressed to a well-attended gathering the following evening, we began to see how this framework is shaping the lives and careers of our graduates. Kim Woodard, the moderator of the evening panel who attended the first year of Middlebury’s Chinese School in 1966, reminded us that it was only 40 years ago that we were fighting a proxy war with China in Vietnam. Woodard was one of the first Americans to enter China during Nixon’s ping-pong diplomacy effort in the early ’70s and has been here ever since. In those early days, Kim felt he knew just about every American doing business in China. Now they number in the hundreds of thousands. Among the new business people in Beijing are an increasing number of Middlebury grads. Well equipped with language skills passed on by John Berninghausen, Gregory Chiang, and other Middlebury and Monterey professors, they are working in banking, finance, education, publishing, technology, and green energy. Many seem surprised at how long they have been here, finding a sense of place in a country that is struggling to seek a balance between promoting economic development and maintaining societal constraints. One young alum, Tao Zhou ’98, reflected on his journey back to China after his time at Middlebury. A math and computer science major with a minor in physics, he credits his liberal arts background for his success in business and his view on life. Although it was the two master’s degrees he received at Dartmouth that gave him skills and credentials, it was his passion for “living a life of uncertainty” that led to his realization that he was born to be an entrepreneur. His startup company in China now employs 30 people and continues to grow. Where will it lead? Tao believes someday he may go back to get a Ph.D. in philosophy and become a teacher. No one in the audience that evening would be surprised. This entry was posted in Midd Blogosphere and tagged Uncategorized on November 8, 2011 by Margaret Paine. I, along with Dina Wolkoff ’88 and Mike Schoenfeld ’73, am traveling in Asia, visiting alumni, parents, and friends of the College. During the trip, we will make occasional postings from Tokyo, Beijing, Hong Kong, and Singapore. This posting is by Mike Schoenfeld ’73. Koichi Ishiyama ’69 can remember the day he could first understand English. It was December 14, 1966. Half way through his sophomore year, the first Japanese student to attend Middlebury was watching Walter Cronkite on the evening news when suddenly he found himself understanding every word. Now Koichi reads six Japanese and American newspapers every day, looking for nuances in the use of language that can inform the next edition of his Japanese-English dictionary—the most popular in Japan. The latest version listed 180,000 words, although Koichi modestly claimed responsibility for editing only about 90,000. Aki Ito ’09 just received a major promotion. Bloomberg is transferring her from Tokyo to San Francisco to be the lead reporter to cover the news coming out of the Federal Reserve offices west of the Mississippi. Pretty heady stuff for the 24-year-old who graduated less than three year ago, particularly when she never took an economics course at Middlebury. 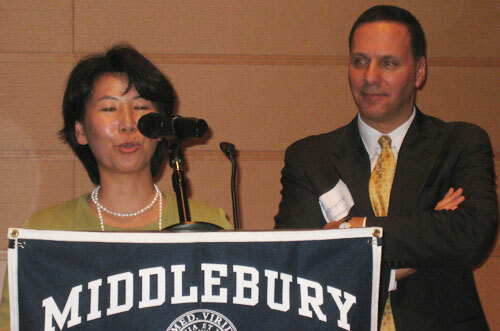 Senae Eda, director of the C.V. Starr-Middlebury School in Japan, introduces President Ron Liebowitz at the Tokyo reception. Last night, Andrew Lind ’13 stood in front of the largest gathering that Middlebury has ever held in Japan and offered a three-minute introduction of President Liebowitz in Japanese. Not bad for a history major who is studying abroad his junior year at Middlebury’s program in Tokyo. He received a well-deserved applause from the crowd that included 10 of his study-abroad classmates. Three people—three different stories—all connected through the power of a Middlebury education. One of the Japanese words that Koichi pointed out to us randomly as he was showing us his dictionary was the word kizuna—literally translated “ties.” Koichi explained that kizuna can be seen as the bonds that connect people together for a common purpose. The shared pride in the accomplishments of our College and our students was palpable at the Tokyo reception and the connections to the college are obviously strong. The Asia trip is off to a great start. I, along with Dina Wolkoff ’88 and Mike Schoenfeld ’73, am traveling in Asia. We are visiting alumni, parents, and friends of the College. The College’s global reach is expanding, and the role of regional networks of alumni and parents is becoming more important to our future as a truly global liberal arts college. During the trip, we will make occasional postings from Tokyo, Beijing, Hong Kong, and Singapore. This first posting is by guest blogger Mike Schoenfeld. When President Liebowitz visits four cities in Asia this week, he will meet a network of alumni and parents that is unlike any experienced by a Middlebury president before him. He will meet with more than 250 people in Tokyo, Beijing, Hong Kong, and Singapore who have either attended or sent their children to the undergraduate college, the Language Schools, the Schools Abroad, or the Monterey Institute of International Studies. While the groundwork for this particular visit was laid by recent visits by College staff members, the network has been developing for decades. The president will have the opportunity to experience the energy and enthusiasm of this network firsthand at 25 individual meetings and events over a six-day period. The first students to attend Middlebury from the Asia were introduced to the College in the late ’50s by C.V. Starr, the founder of American International Group and the source of years of transformational financial support to the College through the Starr Foundation. The Schools Abroad appropriately bear his name. Starr convinced several of his Chinese colleagues in Hong Kong that Middlebury would be a suitable place for their sons to get a liberal arts education. Tom Kan ’64 was one of the earliest to take Starr’s advice and his daughter, Andrea ’96, later followed him to Middlebury—the first legacy student from Asia. Ron will meet with Tom and Andrea, along with several families from all four cities who have current students at Middlebury or students who have recently graduated. In Tokyo, Ron will meet with one of the earliest Japanese students to attend Middlebury, Koichi Ishiyama ’69. Ishiyama’s story is extraordinary. He received a scholarship to attend Middlebury and traveled to the States by boat before making his way across the country to spend four years at the College. He subsequently returned to Japan to teach English and journalism and compile the most popular Japanese-English dictionary in the country. Ishiyama, who served on the Alumni Association Board, has been an active volunteer for the College since graduating. Most of the attendees at the gatherings in the four cities will be an interesting mix of alumni who are expatriates living and working in Asia and more recent alums who have returned to their native countries. Some of the American expats were the first generation of international studies majors and Language School attendees from the late ’70s and early ’80s, when courses were available from professors like Nick Clifford in Asian history and John Berninghausen in Chinese. Some of these early pioneers have been living and working in Asia ever since. Middlebury had very few international alumni until the ’90s, when the fall of the Iron Curtain and expanded admissions and financial aid programs helped to increase the international student population to 10 percent of the study body. In 1980, the figure was less than 1 percent. The newest addition to the mix at the upcoming events will be the alums of the Monterey Institute of International Studies (MIIS). The MIIS alumni body is far more international than the undergraduate alumni body at Middlebury, and the majority of MIIS’s international alumni are from Asia. With Midd and MIIS alumni increasingly interconnecting in the workplace in Asia, the potential of this expanded alumni network is obvious. Finally, the trip will also celebrate the Schools Abroad, with the directors of the Schools in China and Japan attending the events in Beijing and Tokyo with their students who are studying abroad this semester. Professor Senae Eda will introduce her students and the president at the Tokyo event, with the students serving as interpreters. The purpose of the president’s trip is to show the College’s support of the alumni and parent network in Asia and to ask for their help in return. There are opportunities to be explored for involvement in admissions recruiting and career networking and support needed for internships and financial aid. There is no doubt that Middlebury’s global reach is expanding, and the role of regional networks of alumni and parents is becoming more important to our future as a truly global liberal arts college. This entry was posted in Midd Blogosphere and tagged Uncategorized on November 6, 2011 by Margaret Paine.